1930s Morris Minor four-seat tourer. Homepage. This page: Four seat tourer version of the Morris Minor from the thirties. Before WW2, this was how the four-seat Morris Minor tourer looked (there was also a two seater). Ask anyone today what the Morris Minor looked like, and all but the die-hard Morris anorak, will probably describe the curvy Minor penned by Issigonis, that debuted in '48. However the name Minor appeared on our roads two decades earlier, in the shape of the Austin 7's rival shown below. Thanks to Les for the scan. The Minor was launched in 1928, designed to tackle the super-popular Austin Seven head on. In this objective it scored some success, but was never as prevalent on UK roads as the tiny Austin. The publicity shown above features the tourer, with views of its hood in both raised and folded positions. The diminutive proportions of the original Minor are amply illustrated in the text of this Morris publication - "..The top of the windscreen is but 54in from the ground, and many purchasers have found that it has been possible to house this model in a fair-sized cycle shed. It thus makes motoring possible for many who have not room for a larger car and who are not handily situated to a public garage.". Original equipment on the Morris Minor, we're told, included hood & sidescreens, two panel windscreen, speedometer, oil gauge, two level petrol tap, automatic windscreen wiper, pressure lubricating pump, licence holder, calormeter and wings, driving mirror, progressive shock absorbers on all wheels, single bumpers (front and rear), Lucas Sparton electric horn, six volt lighting, starting and coil ignition set, coil indicator light, five-lamp equipment, instrument festoon lamp, rear light, five detachable wire wheels, five Dunlop reinforced cord tyres, spare wheel carrier, and a complete tool kit. For a small car, the Minors of the 1930s were better equipped than some similarly sized vehicles of the day. To view all the adverts for Morris parts currently on oldclassiccar, with links off to related spares on eBay, have a look at the Morris Parts page. 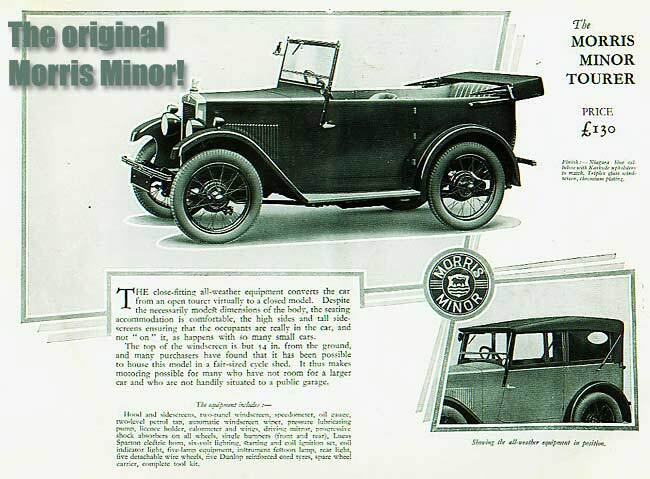 Another open-top version of the pre-war Minor, the Semi Sports, can be seen on this page. Memories of owning a 1934 Minor tourer, in the late 1950s, can now be found on this page. Return to the Motoring Miscellanea section.